Will Drinking Heavy Cream Help Weight Gain? To gain weight, you need to increase the number of calories you consume. Eating or drinking more of high-calorie foods and beverages, such as heavy cream, is one potential way to do this. However, the pros and cons in using heavy cream for weight gain should be taken into consideration before increasing your intake of this food. It's typically recommended that people who're trying to gain weight add about 500 calories to their diet each day to gain weight at a rate of about 1 pound per week. Each cup of heavy cream has about 821 calories. That's a lot more than the 149 calories found in each cup of whole milk or the 83 calories found in the same amount of skim milk. Adding just 1 cup of heavy cream to the foods you regularly eat could result in weight gain, but it's not recommended for good health. Liquid foods don't tend to be as filling as solid foods and don't have as much effect on appetite hormones, according to an article published in Hormone and Metabolism Research in 2008. This means that it may be easier to add calories to your diet through liquids than through solid foods, as you may be able to consume more before feeling too full. If you try to gain weight by drinking high-calorie liquids, drink them between meals for the greatest effect; otherwise, the liquid in your stomach will leave less room for food at meals and limit your overall caloric intake. A problem with drinking cream for weight gain is that it's very high in saturated fat, which may be associated with an increased risk of heart disease. You would be better off increasing calories by eating foods or drinking beverages high in healthy unsaturated fats, such as those found in avocados, nuts and olive oil. A study published in the Journal of the American College of Cardiology in 2015 noted that replacing saturated fat with unsaturated fats or high-quality carbohydrates, such as those found in fruits, vegetables and whole grains, may lower your heart disease risk. To avoid too much saturated fat, it's best to limit your heavy cream consumption, even when trying to gain weight. Each cup of heavy cream has 88 grams of total fat. About 55 grams is saturated fat, which is 274 percent of the recommended daily limit. 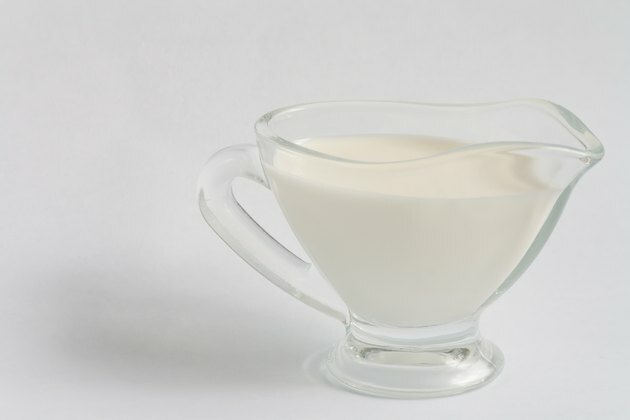 Whole milk has just 8 grams of total fat and 4.5 grams of saturated fat per cup, making it a healthier choice. Dried fruits, whole grains, vegetables cooked in olive oil, 100-percent fruit juice, avocado, peanut butter, nuts and seeds and hummus can be nutrient-dense foods to help you increase weight gain. Smoothies are a good liquid for weight gain, because you can fill them with all sorts of nutritious but higher-calorie foods, like avocado, dry milk powder, nut butters, flaxseed or chia seeds, without adding a lot of saturated fat. Adding a tablespoon of heavy cream to a smoothie provides an extra 50 calories and almost 6 grams of fat. Protein is particularly important when you're trying to gain weight, as you need protein to form muscle. Eggs, lean cuts of beef or pork, seafood, low-fat dairy, legumes and skinless poultry all provide protein. Aim to include about 0.7 gram of protein per pound of body weight in your diet each day if you're trying to gain weight. This means a 160-pound person who's trying to gain weight should eat about 112 grams of protein per day. With just 5 grams per cup, heavy cream is lower in protein than milk, which has 8 grams per cup. CNN: How Can I Boost Body Mass Index Without Adding Fat?